The .VOB (video object) files contain the majority of the DVD data. The .IFO (information) files contain basic information about the DVD and the corresponding VOB files.The .BUP (backup) files are exact copies of the IFO files. How to play Video_TS folder? It won’t be difficult for you to play Video_TS folder on computer since there are many DVD player software such as VLC, BSPlayer, Zomm Player, 5K Player, etc that accept Video_TS folder as input. However, if you wish to transfer and view Video_TS folder on smartphone, tablets, game consoles, set-top boxes, TVs, etc, you will first need to convert Video_TS folder to MP4 format, which is compatible with all those devices. The following article will show you how to convert Video_TS to MP4 with desired subtitles for various devices and programs playback. Although there are many tools on the market that can do the job for you. However, if you are looking for an advanced application with more MP4 output options and also other beneficial video customization and video editing function, Pavtube BDMagic(get Mac version) can be your excellent choice. With the program, you can easily convert Video_TS folder to MP4 format in various different file types including MPEG-4 MP4, H.264 MP4, H.264 HD Video MP4, H.264 Baseline Profile MP4 video, H.264 Main Profile MP4 video, H.264 High Profile MP4 video, H.265 MP4 video, H.265 HD MP4 video to satisfy your different needs. If you wish to play converted files on smartphones, tablets, game consoles, TVs, etc, the program can also do you a great favor to directly output Video_TS folder to devices (android phones and tablets, Xbox One S) or programs(Plex, iTunes, Kodi) specially optimized MP4 file formats with optimal playback settings. To get better output video/audio quality, you can flexibly adjust the output video codec, bit rate, resolution, frame rate and audio codec, bit rate, sample rate and chanels, etc to make them fit with your device or programs. 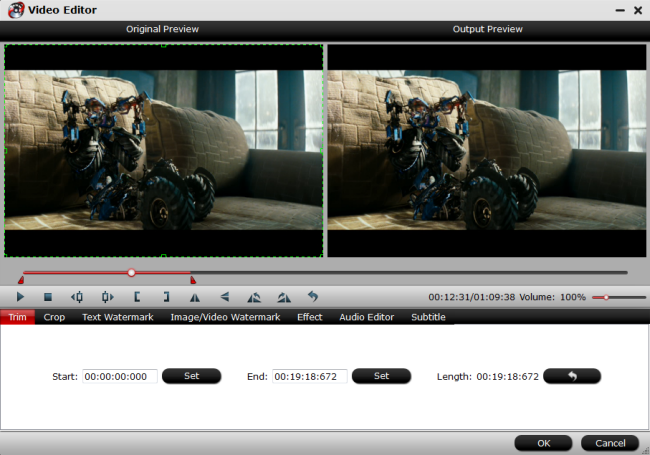 The built-in full package video editing tool also assist you to get your desired files you want. You can flip or rotate video to get it displayed in the right angel, trim or cut video files to remove unwanted parts or segments, crop video to remove the unwanted black bars or area, add image/video/transparent text watermark to video, apply special rendering effect to video, flip or rotate video angel, remove/replace audio in videoor merge separate video into one file. Besides MP4, you can also use this program to convert Video_TS files to other formats such as AVI, WMV, MP4, MOV, MKV, FLV, etc. How to Convert Video_TS Folder to MP4? Step 1: Load Video_TS files into the program. Click “File” menu and from its drop-down list, select “Load from folder” to load DVD ripped Video_TS folder to the program. Tips: Under the Video_TS file displaying list, click the drop-down list of Subtitles, select one of your desired subtitles from original Video_TS files, if you do not want to display native language subtitles, just check “Forced subtitles”options to display subtitles only when a foreign language is spoken. Step 3: Edit Video_TS files. After all setting is compelted, press the right-bottom “Convert” button in the right-bottom and the Video_TS folder to H.264 HD video conversion process will start automatically. When the conversion is over, click “Open output folder” to pop out the converted files, you will then have no problem to play converted Video_TS files on any devices or programs as you like.